Want to Earn Better Grades? Studying & Learning Ace your tests, hack studying, and become an academic superstar. Productivity Get organized, become more efficient, and reclaim your time. Career Skills Learn how to network, crush interviews, and land your dream job. Life Skills Build confidence, make friends, budget your money, and more. Hey there! This page is here to let you know that I’ve just finished something big – my first book. 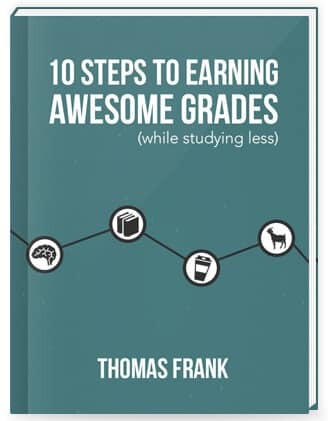 The book is called 10 Steps to Earning Awesome Grades (While Studying Less), and it is, in my opinion, an excellent starting point if you want to become a more effective student. I’ve wanted to write a book for a long time, and after getting acquainted with several authors over the past few months, I got the encouragement to pursue a legit, traditional book deal. Like, an “on the shelf at B&N” kinda book deal. However, I also wanted to provide something to you guys – the awesome students who have been sticking around and supporting CIG. This book is it, and I’m really excited to give it to you. That’s a sneak preview – there are four other sections waiting as well (see, I can do math). You’ll also find some of my personal lessons learned as a student, along with graphics, diagrams, and links to amazing resources. I’ve worked incredibly hard on this book and can’t wait to hear what you think of it. Once you get it, I’ll also send you an email each Friday called Friday Tools and Tips. In it, I’ll let you know about all the new books, apps, and other productivity resources I’ve discovered recently – and keep you up-to-date on new CIG content. © 2019 College Info Geek. You’re cute.